Mazes & Perils is the newest game on the OSR scene. I covered the game in a "Class Struggles" back in May. Then I focused on the new(er) magic using classes in the game. There was a promise then that there would be more classes. Given the Holmesian origins of this game the newest class is, appropriately, a witch. Before I talk about the class I want to give a shout out to cover artist +Jacob Blackmon. He is the one responsible for my new header above. 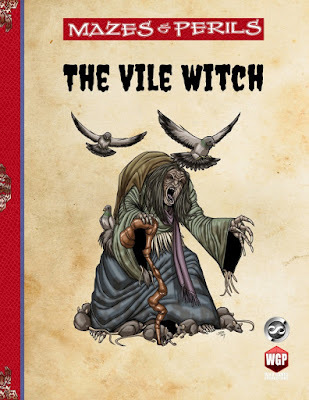 The Vile Witch is a 14 page book (cover, 2 pages of OGL, 1 page of ads, 1 title page for 9 pages of content) dedicated to the new vile witch spell caster. This is a character that revels in what others throw away. 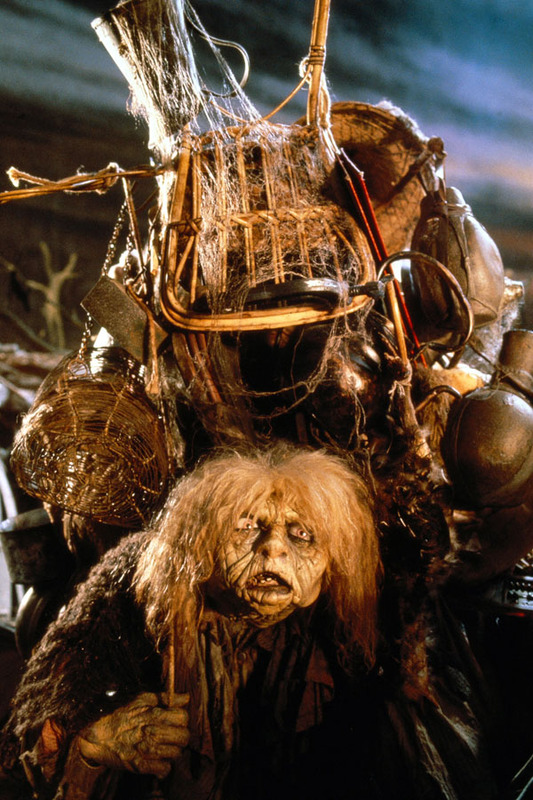 It immediately reminded me of the Junk Lady in the movie Labyrinth AND Maja the witch from Adventure Time; she is the witch that buys Marceline's teddy bear Hambo for its memories. The idea is that there is power in memories and power in items that have been associated with others. It's a powerful archetype really and one with a LOT of potential. But because the witch is so often mired in the refuse of others her appearance and form suffers. The class has a lot of interesting features and powers in addition to some new spells and familiars. Vile Witches are limited to 9th level. I think I see why, but I would try them to 10th or 12th like the other spell casting classes. Though she does have more powers (familiars and "vile blood") as well as a quicker spell advancement. The book has both "vile familiars" and "common familiars". Common familiars can be used by any spell casting class, the vile ones are for the vile witch. The rules are simple, as befitting the M&P game, and easy to use. If you want familiar rules then this is a good choice to be honest even if you never use the class itself. The book also contains 19 new vile witch spells. While these spells could be used with any other magic using class, they are very specific to the vile witch and really give her a lot of flavor and color. For just under $2 there is a lot of material here. It is a very different sort of witch and I like that. I am certain that this class will make for some great NPCs and hopefully some really great PCs as well. What I kept thinking while reading it was that a Vile Witch dedicated to the Goddess, Tlazolteotl would be a good idea. She could even be "good" or Lawfully aligned. Something like a "Sin Eater". Her job is to make good things happen by "eating" the bad things. Only a thought, but it would be how I'd play the class. Mazes & Perils is firmly rooted in the "Basic" era style gaming and Holmes in particular. That being true it works really, really well with my own Basic Era Witch class and many others. If I were to convert this to my own book I might call them a "Sin Eater Tradition" for Lawful witches or "Vile Witch Tradition" for Neutral and Chaotic ones. Have to work out all the details of these, but the idea is that exposure to all this...stuff...changes the vile witch is both physical and supernatural ways. Here are some spells from my book that you can use with the Vile Witch. This spell causes the target creature to suffer from poor health. Witches must succeed at a touch attack to strike the target. Subjects who fail their saving throw suffer a –1d6 penalty to Constitution, with an additional –1 per two caster levels (maximum additional penalty of –5). The subject’s Constitution score cannot be reduced below 1. Material Components: A dried up dandelion. This spell causes the target to have a nervous stomach, thus experiencing severe digestion, discomfort and cramping upon the engagement of any event that’s moderately stressful or exciting. So terrible is this form of indigestion that the target must succeed a Poison saving throw, find a means to relieve their situation within 4 to 7 rounds (1d4+3) or have an “accident” that results in potential embarrassment and potential discomfort. The triggering event of such inconvenience could be most anything, from running into an encounter to finding treasure of mysterious properties to even meeting some stranger along the road. Each worthy event during the full duration of the compulsive enchantment can cause another potential outbreak of discomfort, thus requiring another save. Material Components: A bit of soured milk. This minor hex causes the target creature to have a feeling of vertigo. The subject will feel that they are falling and their footing is unsure. Dizzied creatures suffer a -4 to their dexterity score and any to hit rolls. Material Components: The witch makes a spinning motion with her finger. With this spell, the witch instantly slays all minor vegetation (weeds, flowers, small bushes, etc.) in a 20-ft.-radius. If a creature with the plant type is targeted, it takes 1d8 points of damage per caster level (max. 5d8). Creatures that are not plants are unaffected by this spell. Material components: The witch picks a flower and pulls off the petals while chanting the words to this spell. Subjects of this spell become sick and queasy, feeling as though they are about to vomit. This condition renders subjects unable to attack, cast spells, concentrate on spells or do anything else requiring attention. They may only make a single move or move equivalent action each round. Material Components: A drop of animal fat that has gone rancid. The subject contracts a disease selected from the table below, which strikes immediately (no incubation period). The subject can save vs. Spells normally, but after that only a remove disease or remove curse (or greater magics) can cure them. Each disease affects a different ability. Infected creatures cannot attack and move at ¼ their normal movement rate. Blinding Sickness: For every 2 points of STR lost, a new save vs. Paralysis must be made or the target will go permanently blind. Not contagious. Cackle Fever: Symptoms include high fever, disorientation and frequent bouts of hideous laughter. It’s commonly also known as “the shrieks.” Not contagious. Filth Fever: An infection commonly gained while around dire rats, were-rats and otyughs. Not contagious. Mindfire: Victims feel like their mind is on fire. It is as common as a curse in spell books. Not contagious. Red Ache: Skin turns red, bloated, and warm to the touch. Not contagious. Shakes: Causes involuntary twitches, tremors and fits. It is contagious to others by touch. Save vs. Paralysis prevents spread. Slimy Doom: Victim turns into infectious goo from the inside out. It must be cured in a number of days equal to new CON score or victim will permanently loose CON points. It’s highly contagious by touch. Save vs. Paralysis at -2 prevents spread. Hags Curse: Takes ability damage as listed and the victim becomes infertile or impotent (female or male respectively). Must be cured in a number of days equal to new CON score or become permanent. Material Components: The witch needs crushed verbena in the blood of a viper and vinegar. This spell causes the target to experience horrible itching sensations all over their body. Though not actually inflicted with any real physical ailment, the delusion of itching is so great that the target is unable to perform any action not related to attempting to relieve the persistent suffering. Likewise, the irritation actually causes the target to wound their bodies in the process of trying to relieve the itch. Any sort of thing to scratch and scrape away at the sensations, including stones, weapons, and bits of metal are used. Each round during the duration of the mind rash the target wounds their body for 1 point of damage. Material Components: A bit of dried poison oak. This spell seizes subjects with sudden spasms of violent regurgitation. Those who fail their saving throw regurgitate helplessly for 1d4 rounds. While vomiting, subjects cannot move more than 5 feet per round and cannot fight or cast spells. For all purposes they are considered staggered. When the spasms end, subjects are overcome with a magical weakness which reduces their Strength by 1d4+1 points. This weakness persists for 1 round per level of the witch. Material Components: The witch sticks a finger down her own throat. Upon casting this spell, any creatures within the spell area must make a saving throw or suffer a gnawing pain that slowly spreads throughout their body. During the first round the victims will feel a dull pain that causes a cold sweat. Casting any spells during this round requires a concentration skill roll. On the second round this pain becomes a sharp agony and the target is effectively shaken. By the third round the searing pain has reached its maximum intensity and the victim is nauseated. Each round thereafter the victims must make a saving throw or become wracked with convulsions. They are now completely incapacitated and helpless to defend themselves. The effects of this spell linger in the mind of the victims even after the duration has expired. The targets will feel unnerved for 1d6+1 hours, resulting in a -1 penalty to any Wisdom-based rolls (including magic saves). They will suffer disturbing nightmares during the following 1d4 weeks, making sleeping difficult and reducing the rate of natural healing by one half. Material Components: A branch of nettles with which the witch swats her bared arms or legs. A cursed item in the general sense, many vile witches have found some use for this. This normal sack appears to all magical detection (except for detect curse) to be a Bag of Holding. Once a food item though is stored in this bag, its true magic is discovered. Out from the bag will pour thousands of rats that will run in every direction away from the holder of the bag. The bag contains 1,001 rats. A save vs. Paralysis must be made or anyone in 10’ feet of the bag will be unable to move due to all the rats. The rats will bite and all within 10’ of the bag will take 1d6 hit points of damage. All items are Copyright 2012, 2016 Timothy S. Brannan. All spells and items are released as Open under the OGL. The Witch: A New Class for Basic-ear Games, Copyright ©2012, Timothy S. Brannan. Elf Lair Games. For a while now I have been contemplating returning to an old feature here, Monstrous Mondays. A few other bloggers I met in the A to Z Challenge also do it, tailored to their respective audiences. The last one I did was just over a year ago (Yog, Monster from Space) but I never kept going. For this blog, I would feature monsters that would likely appear in my games. I would likely focus on OSR stats. Also, I am likely to release them all as "Open" via the OGl. Art is excluded from that of course. Wish to join me? Let me know each Monday and post with the hashtag #MonsterMonday (Twitter) or #MonsterMonday on Google+. I think for my "OSR" stated monsters I am going to start using the format/stat block I used for some of the vampires I did last year. Special Attacks: Cold 6d6 (breath), once per day. Cause Fear once per day. 3 Morale is "Basic" Morale and based on a 1-12 scale. Multiply by 1.6667 for 1-20 scale. 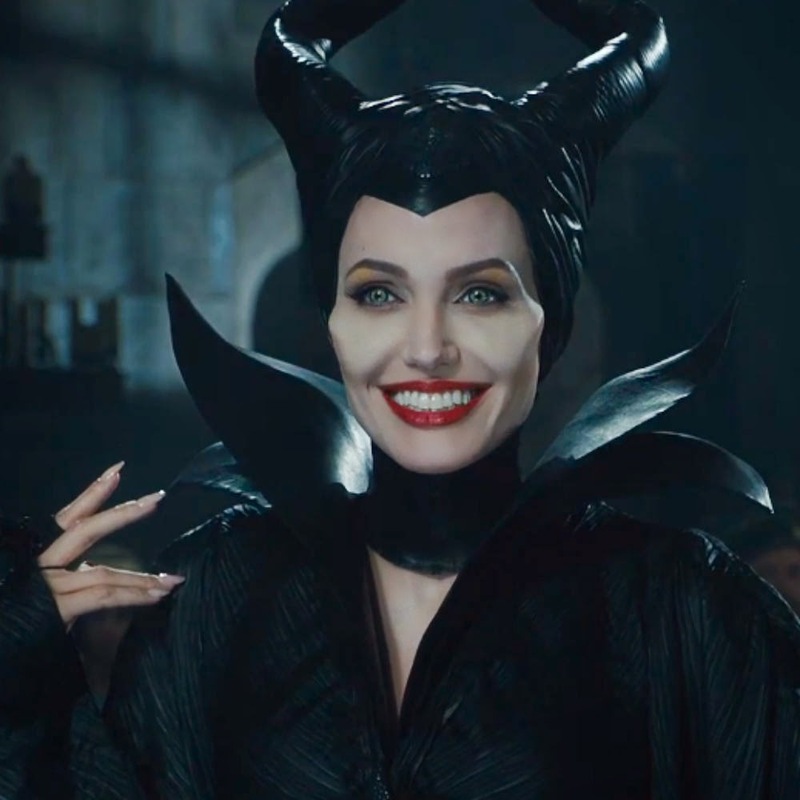 5 monster witches can use an "absolute value" for Charisma. So a really bad CHA is just as good as a really good one. Known as the Crow of Winter, The Cailleach Bheur is a very deadly hag. She appears only after Samhain/All Hallow’s Eve and stays till Beltane eve. While as evil as other hags, Cailleach Bheur is more interested in eating sheep and deer than children. 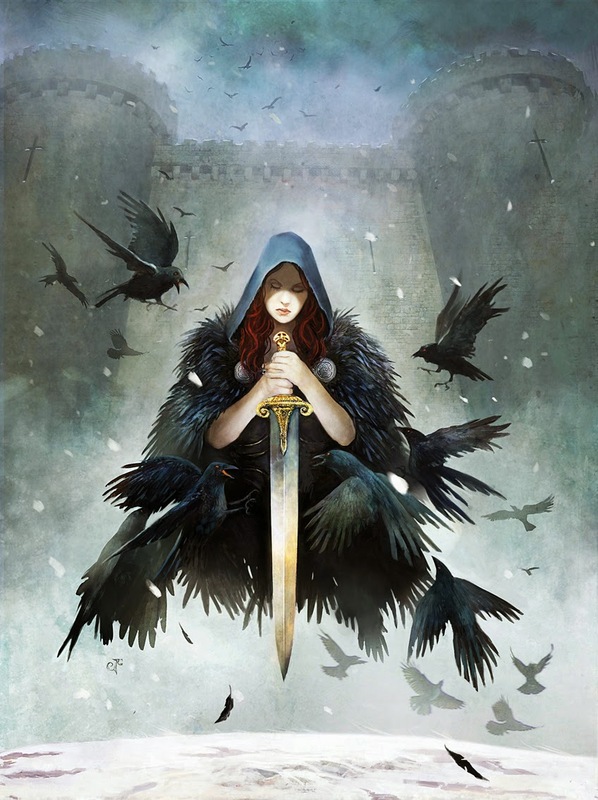 In Ireland and Scotland, she is the personification of Winter. During the summer months, Cailleach Bheur turns to stone and is indistinguishable from the other standing stones of the area. The Cailleach Bheur was cursed into her existence back in a time before writing came to Scotland. One tale, disturbing as it sounds, describes the Cailleach as the ancient Protector of Alba, maybe even a faerie queen or goddess. In her previous life, the Cailleach Bheur was a lone protector of animals (a Ranger) and a follower of the Great Goddess. One night he fell asleep by a well. The well overflowed with the thaw and she nearly drown. She invoked powerful magics to move the water away, but in the process created Loch Awe (in Scotland) and drowning several villagers and cattle. As repentance, she is to walk the snowy earth till she can feel the mid-summer sun on her face, something that can’t ever happen since she is cursed to be stone from Beltane to Samhain. The Cailleach Bheur still protects her lands as she did before, ignoring humans unless they tread on her domain, then she kills them with glee by freezing them solid. She blames humans for her current state. The Cailleach Bheur is believed to be at least 400 years old. Staff of Winter: Possibly a remnant of her former life the Cailleach Bheur carries a magical staff. The Staff of Winter is made up of holly and gorse branches intertwined to form a 7’ long staff of solid wood. It acts as a magical focus tool providing the Cailleach Bheur +2 magic to all magic related rolls, attacks, saves and checks. Anyone in possession of this staff can command Cailleach Bheur to leave the area by holding the staff and saying “Bì falbh buitseach!” (begone (get out) witch!). Both Cailleach Bheur and her staff will disappear after the command is uttered. This would require research into Cailleach Bheur specifically or local lore. Section 15: "The Cailleach Bheur". Copyright 2016 Timothy S. Brannan. We are sticking with the Philippines today. Why? Because they have some awesome freaky fantastic vampires there. I swear they have the Carpathians and Eastern Europe beat. The Berbalang blur the line between vampire and ghoul. They are described as "bat winged creatures that live underground and eat corpses. They make a loud moaning sound that can be heard for miles when they feed." 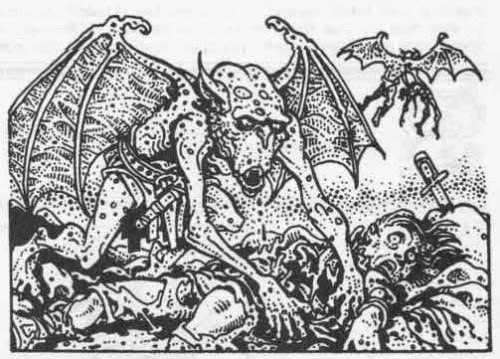 The Berbalang appeared in the Fiend Folio for AD&D 1st Edition and it was something like an astral ghoul. It changed a bit over the editions to what we have below. Once per day as a full-round action, a berbalang can enter a trance that separates the creature's spirit from its body. This splits the berbalang's current hit points in half between its body and its spirit. The berbalang's spirit body gains the incorporeal subtype and special ability; otherwise, it retains the same statistics as its physical self with the following changes: AC 19, touch 19, flat-footed 10 (+4 Dex, +4 deflection, +1 dodge), single incorporeal touch attack that deals 1d4 Constitution damage on a hit as its sole attack. This spirit projection can travel no more than 1 mile away from the berbalang's body. Because the creature is only partially in existence when in this state, its body gains displacement as the spell. When separated in this way, the berbalang's body is unconscious and helpless. If the berbalang's body is injured while in this state, the separated projection immediately returns to its body, and the body loses displacement. If the physical body is slain, the spirit body immediately dies as well. If the spirit is reduced to 0 or fewer hit points, it returns to the body immediately. A berbalang in spirit form can end the effect at any time as a standard action, at which point the spirit immediately returns to the body. When a berbalang's spirit form returns to the body, add both the spirit body's hit points and the physical body's hit points back together to determine the creature's current hit point total. Berbalangs prefer to make their homes within a day's travel of humanoid settlements. These lairs are well hidden and sometimes protected by other undead creatures. Some berbalangs set themselves up as secluded shamans or wise old crones, using alter self to appear human. Ultimately cowardly, berbalangs rarely attack a settlement directly, preferring to pluck its meals from those who stray too far from civilization. A berbalang stands as tall as a human and rarely weighs more than 100 pounds. Don't you love it when you are doing a bit of research on a couple of different things and suddenly you read one thing and all these disparate threads come together as a nice whole? Jung used to call it Synchronicity. I say that if you bury your head in something for long enough your research numbed brain will see connections everywhere. In either case this is some thing that clicked for me the other day. I was doing research on the the original Balor/Type VI demons in 1st Ed AD&D and how there are only six of them. The DMG lists them as Balor (their leader and the largest), Errtu, Ndulu, Ter-Soth, Alzoll, and Wendonai. Wendonai. Doesn't exactly fill you with fear does it. Since I am using the OGC Balor as the basis of my own Baalor in my games I wanted to expand them a bit. So these names are purely off limits (save for Balor). That tied in with all the myths I have been reading (well, since forever) of Ireland, England, Scotland and Wales (er Walesland?). There was a Balor there too. Only he was a giant with one eye on his forehead and another on the back of his head. I was reading about all these giants when I came across Gogmagog. I had been familiar with Gog and Magog and Gogmagog because of an off-hand reference on Doctor Who years and years before. 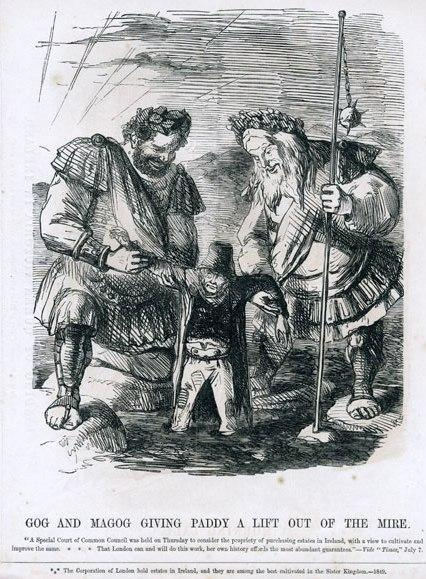 I had scribbled down that Gog and Magog were akin to Ogres, but divine. I choose ogres because of something the Doctor said "Gog, Magog and Ogre", pronounced 'O-gree'. In the book of Revelations Gog and Magog were the ultimate enemies of God's people. Though to be fair Gog and Magog hopscotch all over the Bible and one is never really sure if they are individuals, peoples, or lands. Gog and Magog also appear in the Qur'an as a monster (the monster of Gog and Magog) or again as a land. Recently I reread the Silmarillion by J.R.R. Tolkien. The chief of the Balrogs was a being known as Gothmog. I knew I was on to something. Obviously Tolkien, a professor of English literature and languages (especially Old English) knew of Gogmagog. In some early versions of Tolkien's work Gothmog is even described as a "son of Melkor and the ogress Fuithluin", Later a "Gothmog" was also the orc in charge of Mordor's army in the Return of the King. Obviously named after the Balrog (and less confusing than Glorfindel of Rivendell vs. Glorfindel of Gondolin). All of this though has given me some ideas. Here they are using OSRIC and LL Advanced Edition Companion. All text below is considered Open for use under the OGL. Section 15: OSRIC Chapter V copyright 2007-08 by Stuart Marshall, Chris Hopkins, James Boney, Robert Ross, Jeremy Goehring, Mike Davison, Daniel Proctor, B. Scot Hoover, Chris Cain, Bill Silvey, Floyd Canaday, Vincent Frugé and Matthew James Stanham. Adventures Dark and DeepTM Bestiary, Copyright 2011-2013 BRW Games, LLC. Gog and Magog for Advanced Era Games, Copyright 2015 Timothy S. Brannan. Gog and Magog are two unique demons of the same sort of Balor. While they are larger and more aggressive than their kin, their natures preclude them from ruling large numbers of lower demons as their brethren might. Gog and Magog are described as "brothers" and this has never been proven by any occult scholar. They share a physical similarity to each other. 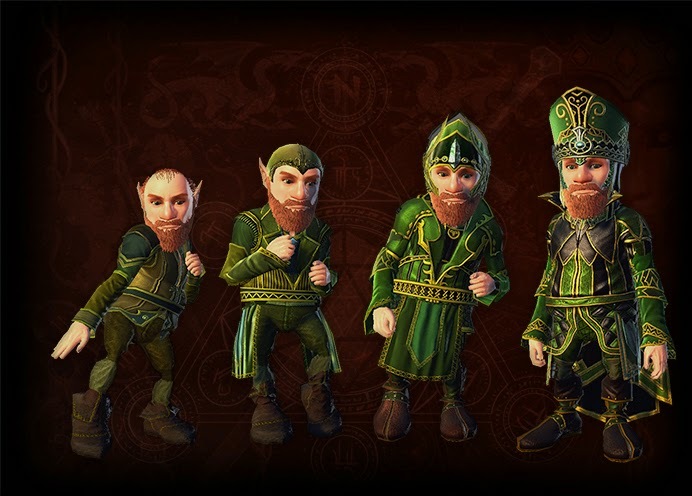 Gog is large, predominantly red in color with black hair and beard. He wields a large flaming sword in battle. 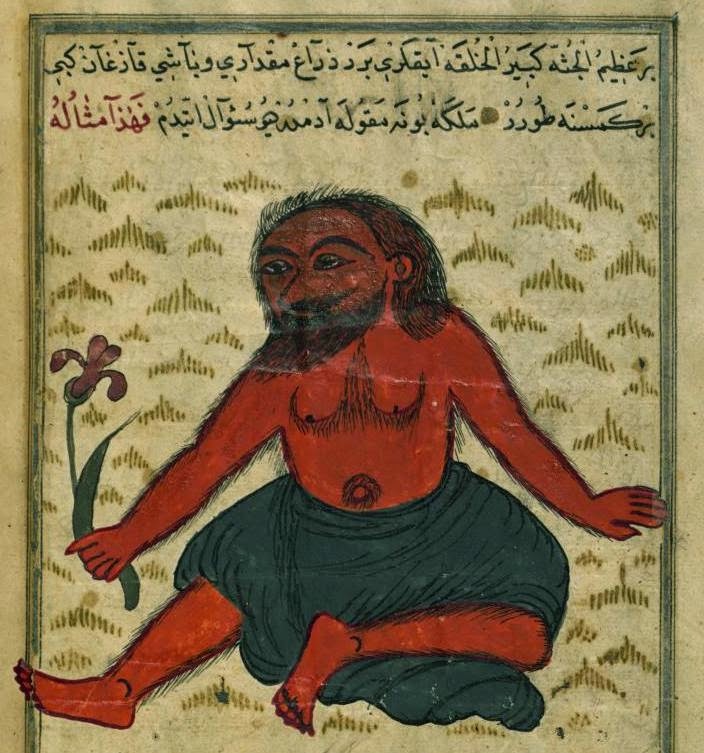 Magog is larger, predominantly black in color with red hair and beard. He wields a large flaming great axe. Either causes an extra 3d6 points of fire damage per hit. Gog and Magog can also use the following powers at will: detect invisibility, detect magic, dispel magic, fear (as the wand), pyrotechnics, read languages, read magic, suggestion, telekinesis (600 lbs. 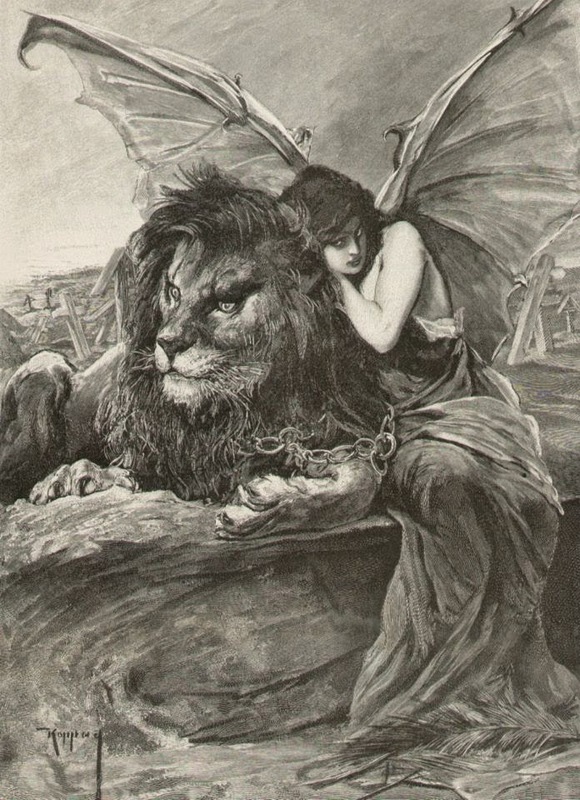 ), and symbol (despair, fear, sleep, and stunning). A +2 or better magical weapon to hit. Unlike other demons, Gog and Magog cannot gate in lesser true demons. Instead they may summon 2d6 demonic Ogres each. These creatures appear as normal ogres save that their skin is red and they are immune to fire, poison, sleep and charm spells. They also need a +1 or better magical weapon to hit. Demonic ogres always have the maximum hitpoints for ogres. Much like other demons, these two will bicker and fight and even plot against each other. However when confronted with a common foe the will work together to defeat them. They are completely loyal only to each other. They are often found in each other's company. They are most often found on the Material Plane, the summoning ritual for one will also summon the other and only rarely in the Abyss. They are violent, aggressive and constantly angry. Neither is much for planning, but when pressed they are good strategists and have been used as generals by stronger Demon Lords and Princes. They have even been known to serve the Baalseraph Ahriman, also known as Angra Mainyu. A common tactic among the Demon Lords that engage their services are to choose a location and let the brothers go. *Many "Advanced Era Games" use a d8 for monster HD. I prefer to use a d10 myself. ** Adjust according to your preferred system. Here is the only OSR Scarecrow you need. This is the Scarecrow from The Witch. Scarecrows are basic guardians similar to golems, but not nearly as powerful. Like typical scarecrows, their bodies are made of straw and cloth. The stumble about their assigned area poorly and attack most anything that wanders through it. Some Scarecrow Guardians are bound to a post. A Scarecrow can use their paralyzing gaze to imprison any trespassers (save vs. Paralysis, fail means victim remains rooted to the spot). Scarecrows are assigned to protect a particular area. They never leave the area, even when chasing an intruder. They will attack anything, humanoid or animal like in appearance that walks into its territory unless otherwise instructed by their creator. 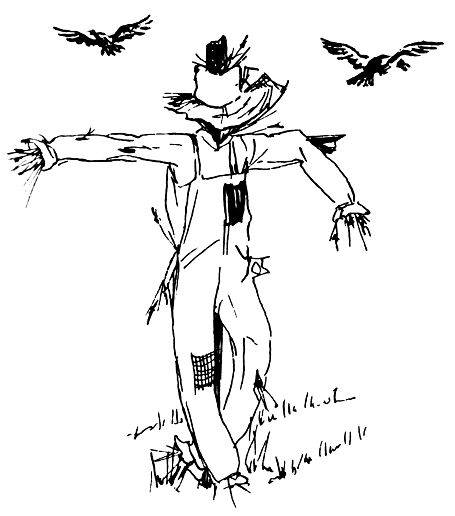 A scarecrow is immune to mind-influencing effects, poison, disease and similar effects. They are not subject to critical hits, subdual damage, ability damage, energy drain or death from massive damage. All content is designated as Open for the Open Gaming License.